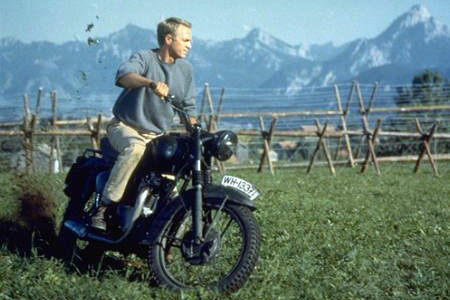 When I imagine a good handling bike I often visualise Steve McQueen in The Great Escape. Not the famous barbed wire jump which was actually done by a mate of his, but the riding he does beforehand while trying to outrun the jerries along the lanes and across the fields. The way he chucks that 170-kilo TR6 around on ordinary tyres and suspension, skid-turning with the back brake and sliding around but in control, always struck me as optimal moto/rider interaction. With a hefty old dog like the Triumph it must be down to skilful riding too, as well as a low slung machine, but if a bike can bring out that sort of confidence I’d be pleased with it. 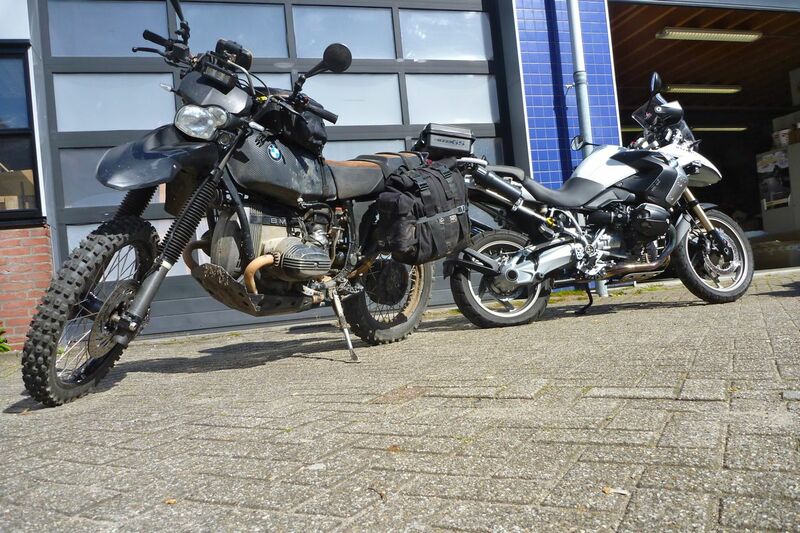 My 650X wasn’t in such good shape when I rocked up at Hyperpro’s workshop, halfway between Erik’s Hot Rod Bar and the Hook van Holland ferry port. It felt like the head bearings were notching, and in the last 1000 miles the shock felt shot too. I didn’t feel like the Cooler King throwing it into roundabouts while in fact heading for the kerb. I thought oh well, I’ve finally lost much touch but at least the Xco is jolly economical and the switches fall easily to hand. Bas at Hyperpro suggested I came over for a custom suspension fitment. In his experience, being there with your bike makes all the difference. Everyone told me I’d spend the whole day at his workshop watching him work and they weren’t wrong. 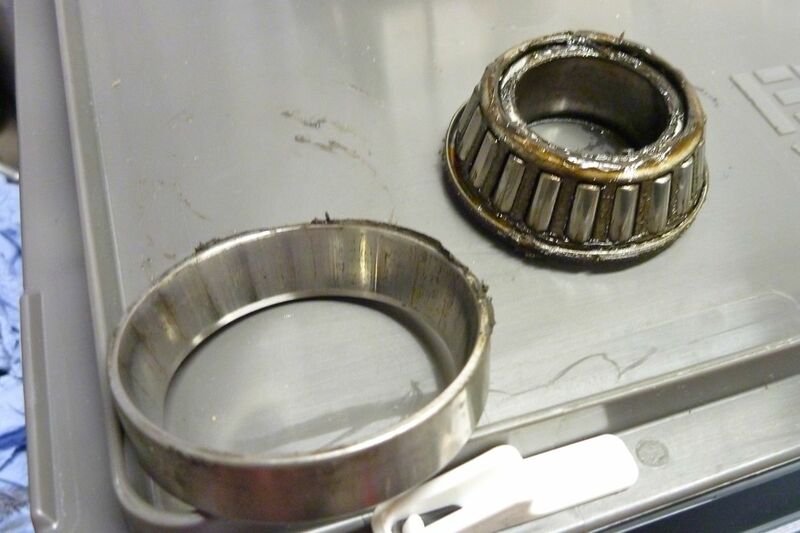 For weeks I’d suspected the head bearings were gone, something most noticeable at low speed. But lifting the front wheel I couldn’t detect anything and thought it might just be tension from the brake hose arrangement. Erik suggested cupping from the Tourance which was down to 2-3mm. With the bike yanked over, it took Bas a couple of seconds to diagnose the notch in the bars’ arc and which now felt obvious. During suspension transplants he told me they get through a lot of headsets at the HP workshop. The Xco’s relatively elastic alloy stem doesn’t help in this regard, though Bas admitted his hard running BMW G/S (see below) eats a set every 5000km or so. I wasn’t expecting it, but Bas got stuck in and replaced my worn bearings. I still don’t get how this notching occurs; fork impact + wear + lack of care and grease I guess. 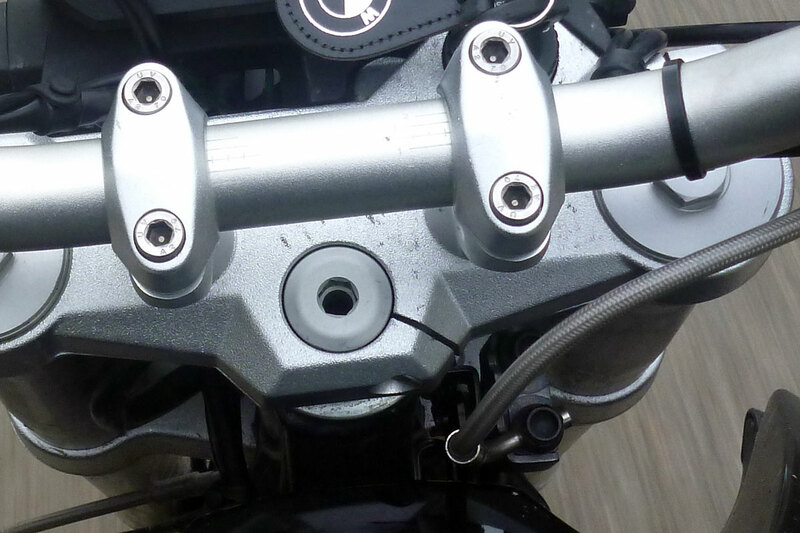 Once fitted, he pointed out the noticeable change in resistance when tightening the 10mm hex headstock adjustment nut (left) by just a couple of degrees. That’ll need doing in 1000 miles as the bearings bed in. 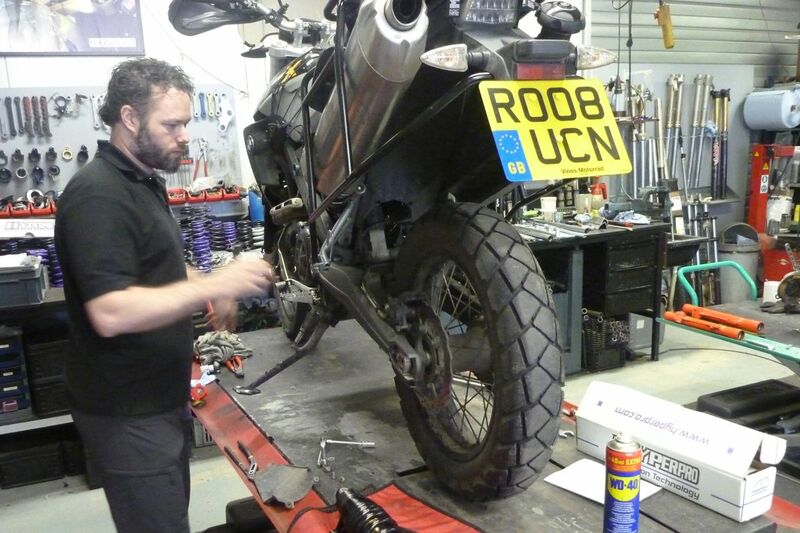 He then got to work on my forks, identifying barely visible scratches on the chrome sliders which he buffed out with a strop and a file (right). I’ve always doubted the genuine advantage of USD forks. 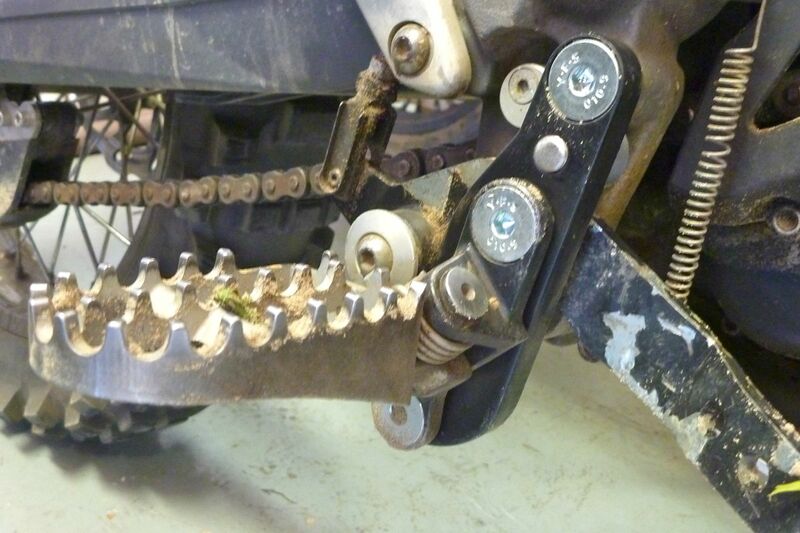 The best explanation I recall reading is that the heavy steel slider element sits lower for lower CoG, but then the alloy needs to be thicker to withstand the triple clamps and the steel is undesirable unsprung weight. I’ve also since been told it was a way to get more travel. To me they just look ‘upside down’ with a vulnerable slider out in the stone-strewn breeze. 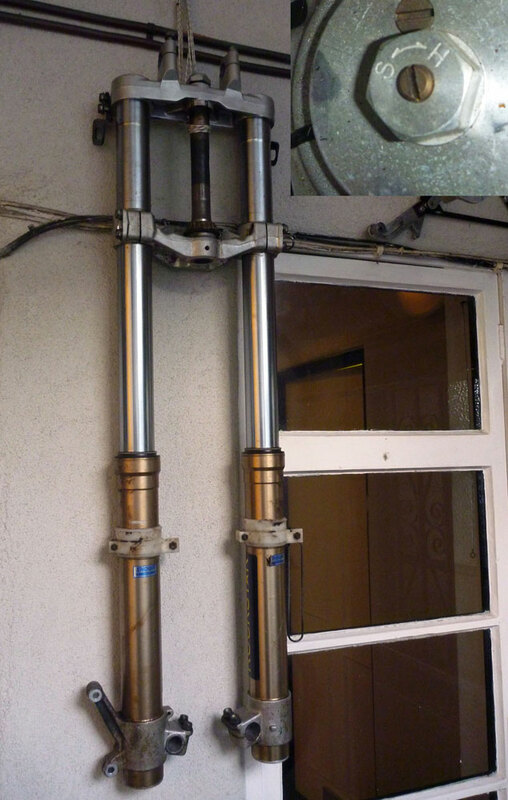 It’s well know that telescopic forks are a regretable compromise on a bike: neat and cheap to make but with drawbacks that we all learn to ride around. 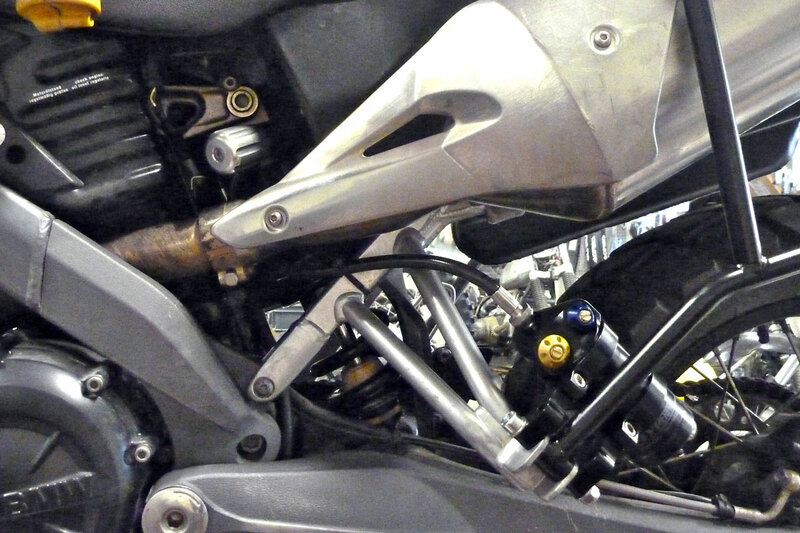 In fact I’m convinced a huge part of a GS12’s appeal is the poise it gains from its Telelever front end. To paraphrase something I read recently on adv ‘For a two-story building a GS handles pretty well’. There’s only so much you can do to Xforks unless you replace them with something else. It doesn’t have to be anything flash either, Bas recommends a 48mm right-way-up 48mm DRZ400 forks (right) which are easily found on ebay for around 100 quid plus clamps. I bought a set and plan to get them Hyperpro’d and fitted to the X. [In the end kept them for another project]. Once the sliders were as clean as they could be, Bas renewed the seals and cleaned up the bushes which run between the telescoping sections. He then slotted in the appropriate Hyperpro forks springs (left) and slipped in a lesser quantity of lighter oil (heavy oil is used to disguise soft forks). Bas explained why fork oil should be changed; not so much because it breaks down like motor oil but because it collects contaminants and humidity so needs flushing if you’re to avoid tedious seal failure. To stop that happening too soon, before remounting the forks Bas slipped on a pair of neoprene socks to protect the sliders. A quick word on progressive springs. Most bike springs are linear; wound at a consistent rate end to end. While some riding applications are said to benefit from linear springs (road racing on smooth tracks, for example), the main reason we get linear is cost, as with so much in bike suspension. Up to a point, the pivot on a mono rear ends adds a progressive element, and in the 70s twin-shock era it was thought laid over shocks had a similar effect. Also from the twin shock era, you may recall dual rate springs which at a glance look progressive, but merely have a more dense section at one end. 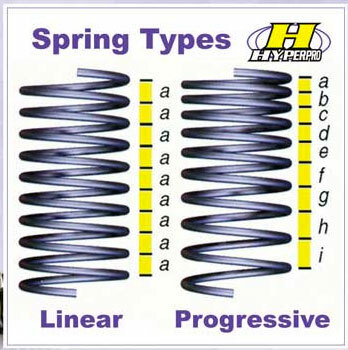 Only progressive springs have a constantly variable spring rate right across their length. Because of this the spring can react to small surface irregularities, full-on hits and everything in between. Linear springs can be factory wound by the mile and then chopped up like salami, but each progressive spring has to be made individually; it’s a more sophisticated and higher end solution and Bas had a good trick to demonstrate their efficacy: two little finger springs (above), one linear, one progressive. 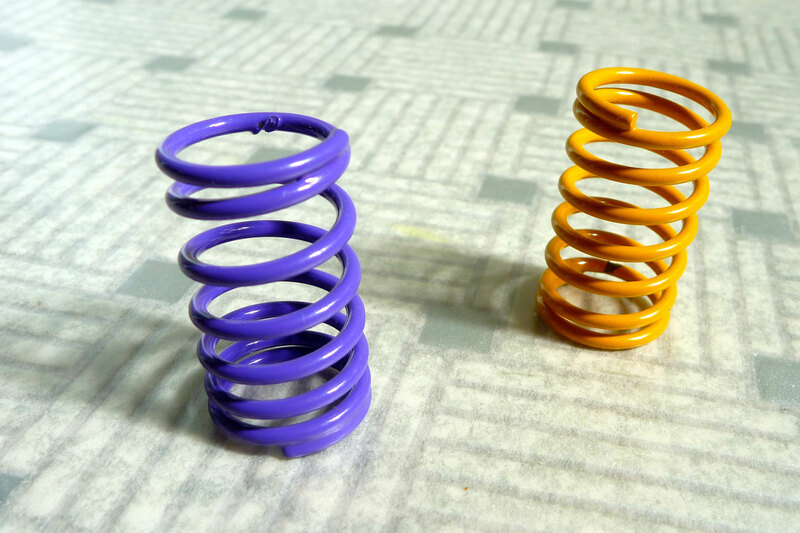 The purple progressive spring is easier to compress initially but, unlike the yellow linear one, is impossible to compress fully. Progressive compression in a nutshell. Looking into suspension earlier I noticed the ‘P’ word bandied around disingenuously. 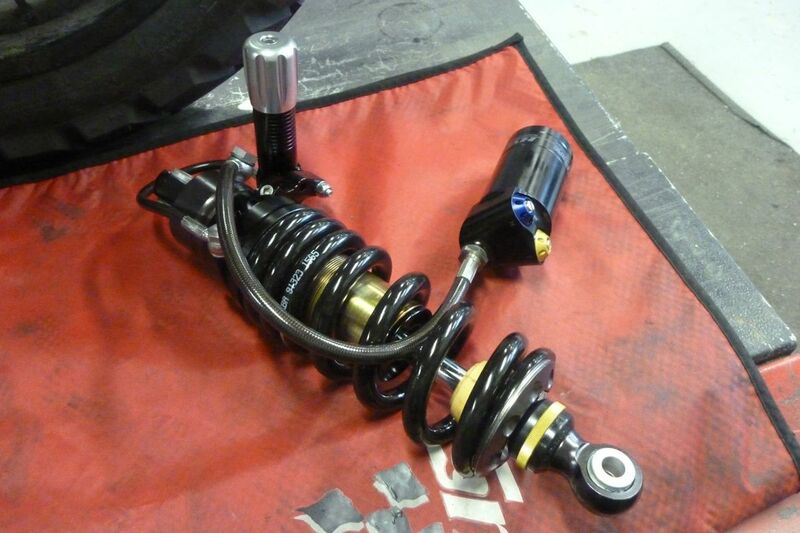 Hagon’s aftermarket monoshocks claim ‘fully progressive spring pre-load adjustment’. Examine that phrase closely and you’ll see it means not much at all, but I bet a few have been caught out. According to Bas, stiction is the nemesis of smooth suspension response and the reason many riders misdiagnose ‘harshness’. Of course ensuring friction-free operation while hammering your telescoping tubes over corrugations or flexing them under hard braking is all asking a bit much, but with careful assembly and maintenance, stiction can be minimised. Only then can the full effects of a finely tuned shock be appreciated. Now for the shock. I’d felt the Sachs unit go on a recent ride up to Scotland. 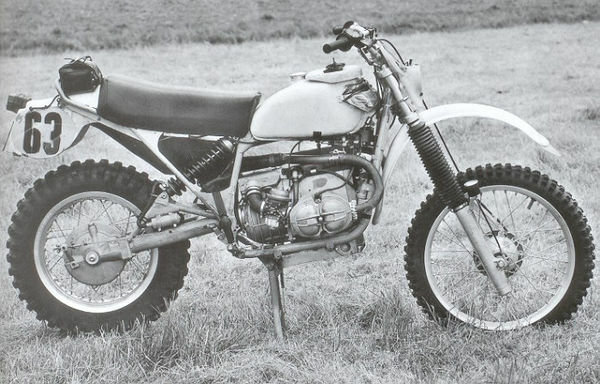 Perhaps the bike’s early life at the BMW Off Road School had included more than the usual amount of play jumping. It certainly had when I’d visited. The headlight beam now shone higher than it used to, but when I tried to adjust the shock, the preload was maxed out and I didn’t even notice the rebound damping which was ineffective anyway. 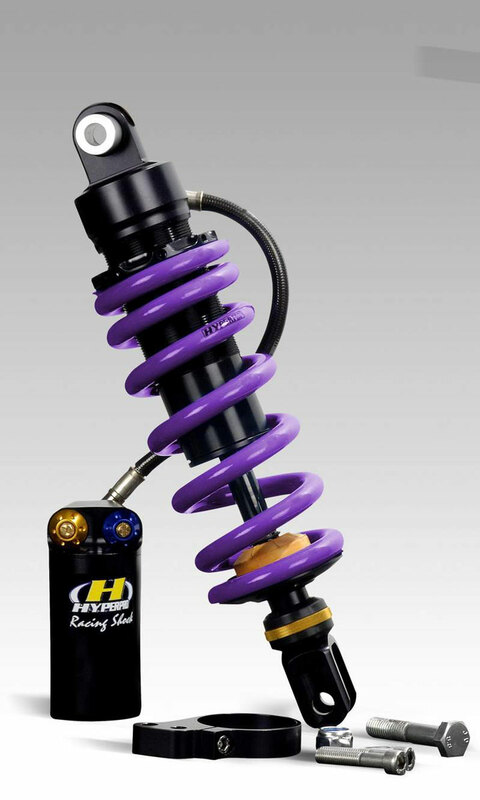 I’d originally planned to just whack on a Hyperpro spring on the shock body, but that would have been a mistake. It’s not the spring that wears out (though the original may be too soft for your needs, especially when loaded), it’s the seals and gas and ill-specified valving inside. Most bikes run what they now call emulsion shocks, as that’s what happens to the oil and gas once it all froths up following a series of bumps. Once the oil is aerated much of the damping effect gets the lost until it all settles down and the gas and oil separate. 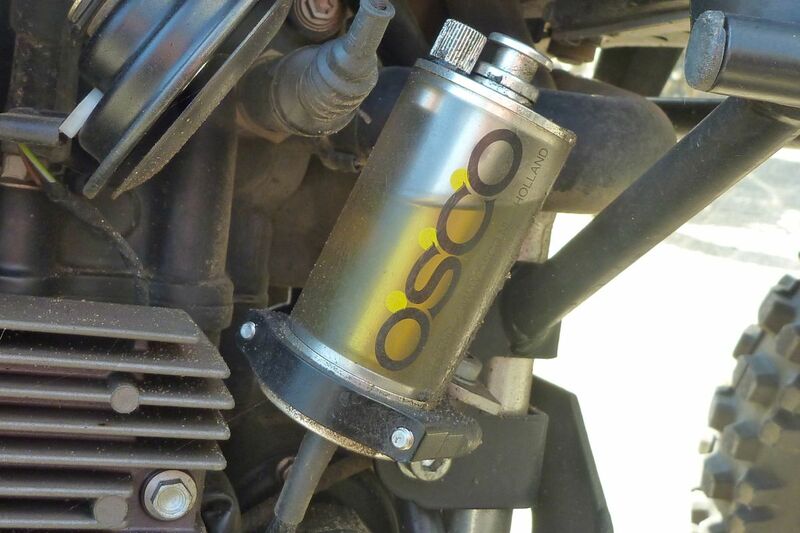 An emulsion shock will be fine for regular road riding, but soon reaches its limits when you add heavy and variable loads and rough terrain. All these years I managed fine on my Teneres and whatnot, just jacking them up at the back and stuffing a bit of sawn off bar end under the fork caps for some pre-load. The one bike I had with good OE suspension – the XRL650 for Desert Riders – was notably better than the previous XTs. Many times I’d get out of shape and expect to be going over the bars, only to have the superior front forks save the day. On that trip we all fitted K-Tech progressive springs. The problem had always been on the back where nothing short of several hundred quid’s worth of WP or Ohlins seemed a lot of money for an uncertain result. As long as it didn’t bottom out, that was fine with me. 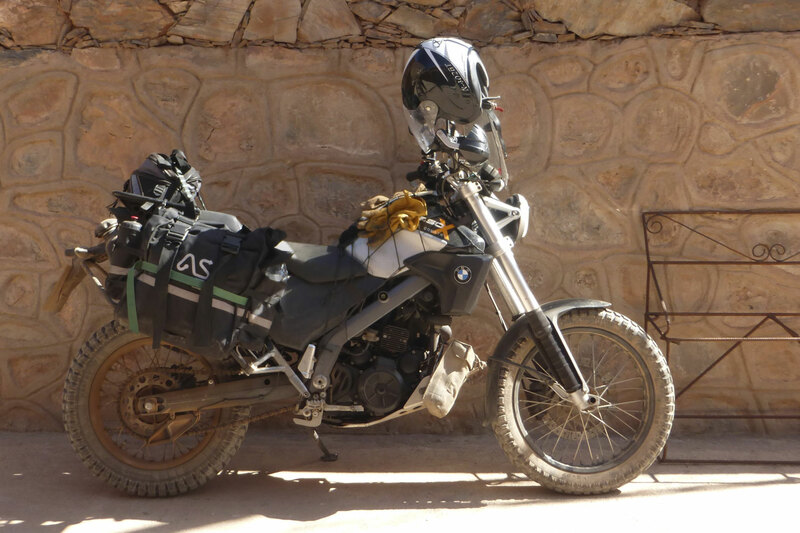 The fatigue and boat-like handling just came with territory when riding heavily laden travel bikes in the desert. Bas doesn’t just invite you to lounge by the coffee machine while he whips a shock off the shelf and pops it on your bike. He builds the unit up from scratch, adding in shims across the damping apertures to suit your bike, weight, riding style and anticipated loads. I was getting Hyperpro’s top end 461 model (similar to left) with hydraulically adjusted preload (like the OE Sachs unit), 45 clicks of rebound damping at the base, and two settings covering low-speed plus high-speed compression damping on the remote reservoir. This latter feature is what’s missing from most average shocks but adds to the spring’s downward resistance and is what makes a big difference to fine tuning with changing loads. Once the insides were assembled, the unit was charged with oil and the remote reservoir attached. In here there’s a bladder of nitrogen gas separated from the shock’s oil which feeds into the reservoir via the hose. A separate gas bladder can just as easily be located in the body of the shock if there’s room, though it runs cooler outside. Nitrogen is used as it’s dense and so less prone to leaking away, compared to regular air (which is 78% nitrogen anyway). Once a location was fixed for the remote reservoir with its high/low-speed comp damping dials, the static sag was assessed; about 3cm felt at the tail rack. Sag is important as it sits you midway (more or less) in the shock’s stroke so it can extend fully before settling down. The whole point of suspension is to allow the wheels to move up and down as much and as responsively as necessary while the sprung weight (bike and rider) remains isolated and level. After at least ten hours of methodical work, my Xco had been resprung. It sat maybe half an inch higher, though I could still get both feet flat on the floor. A quick blast round the block wasn’t night and day but revealed improved steering on the first bend; it went where I wanted in a predictable manner. Then a few dried mud bumps along the edge of a field got both ends pumping smoothly. All well there. 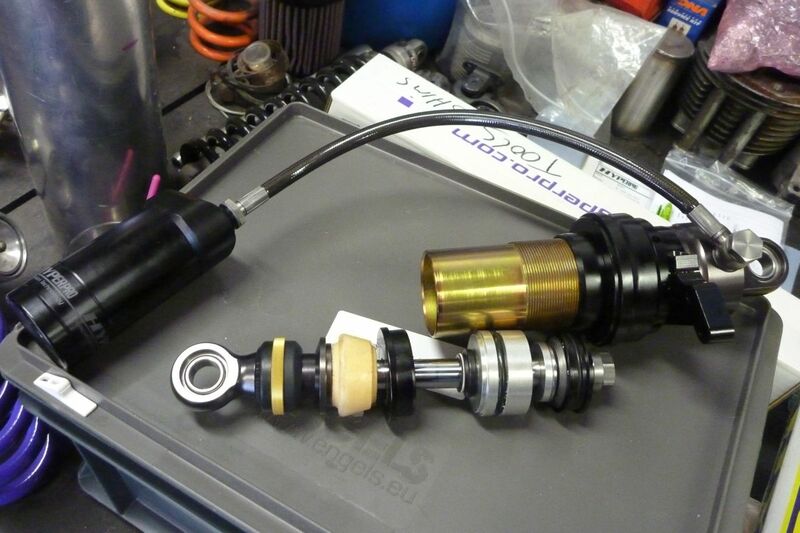 A 461 shock for the Xco costs about €950 with the optional hydraulic preload adjuster (miles better than using the supplied C spanner). 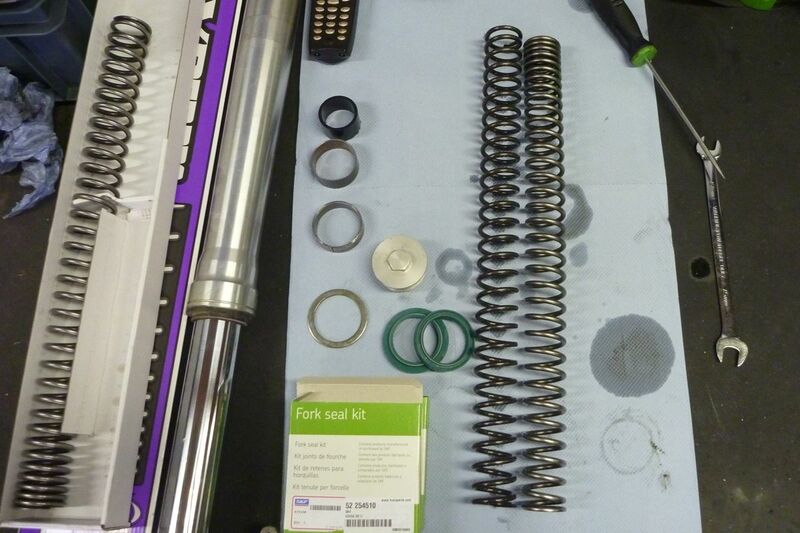 A set of fork springs is €150 plus €50 for a pair of fork seals. Custom fitment is well under €200 for both ends (not including head bearings). If you’re planning a day visit to Hyperpro you may like to know that the overnight ferry from Harwich arrives around 8am local time and returns at 10.30pm, so you can get Hyperpro’d in a day. I paid £220 for the boat with cabin. Having no less than four adjustments on the shock is going to take some experimentation to see the best results, and they’ll vary with load and terrain. That will be something I’ll get to grips with in North Africa later in the year. XCountry in Morocco. Hyperpro made all the difference. In return for the work and suspension Hyperpro have been offered an advert in the future 6.2 reprint of AMH. Though he’s a big fan of the early 90s R80 Monolever (the post 7 series Boxers), one of Bas’ bikes is a cool 800 G/S from the previous decade. 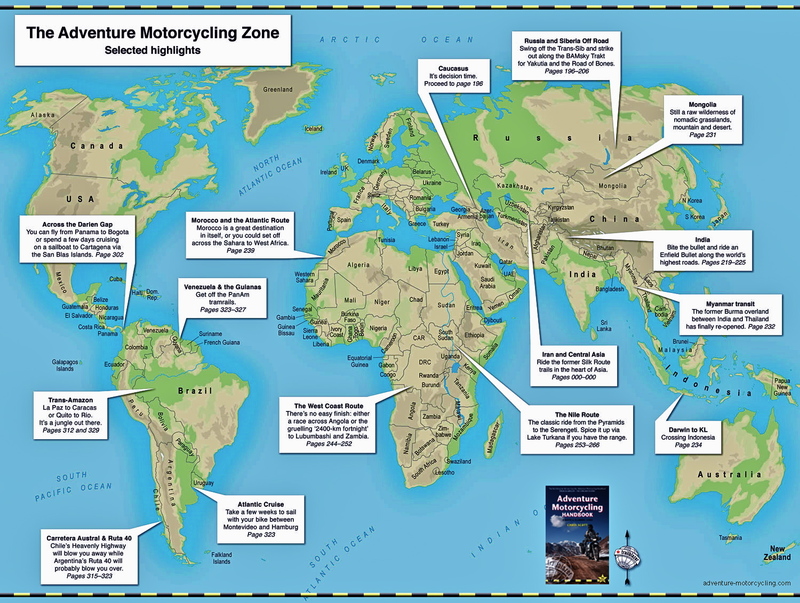 Alongside a parked up GS12 you can see the different paths that ‘adventure motorcycling’ has taken over the intervening years. Actual adventure and the other type. Where did BMW go so wrong? Well, look at the table on the right and you’ll see that perhaps they’ve got it very right. 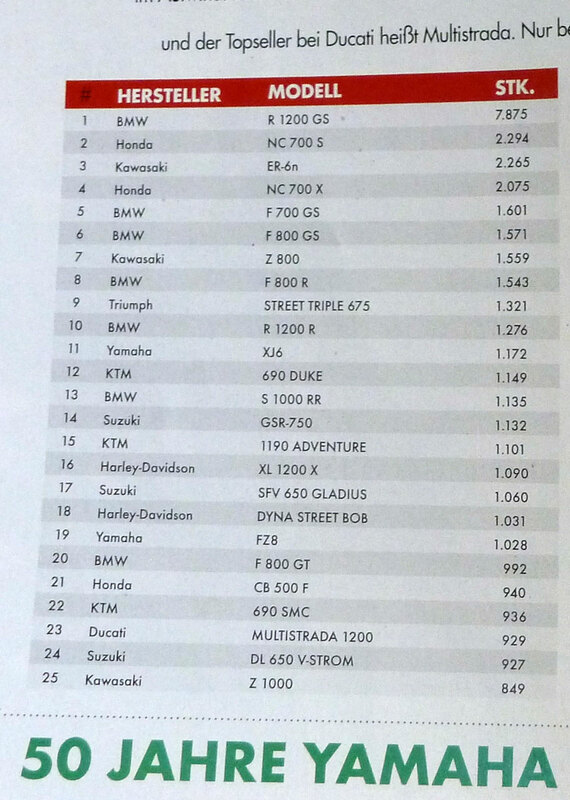 The 12 is by far the most popular big bike in Germany and many other places too, including the UK. But the Kawa ER-6 third? Perhaps they were on special in 2013. Bas’ 180-kilo G/S reminded me of those ISDT enduro racers from the 1970s (left) from which the Dakar desert racers took their lead. His G/S has a longer swing arm, possibly a one-litre motor, forks from a dirt bike, Excel rims and a mini tank behind the battery in the space opened out by the longer swing arm. Best of all, it just looked like you could take it anywhere you can manage with an XChallenge. 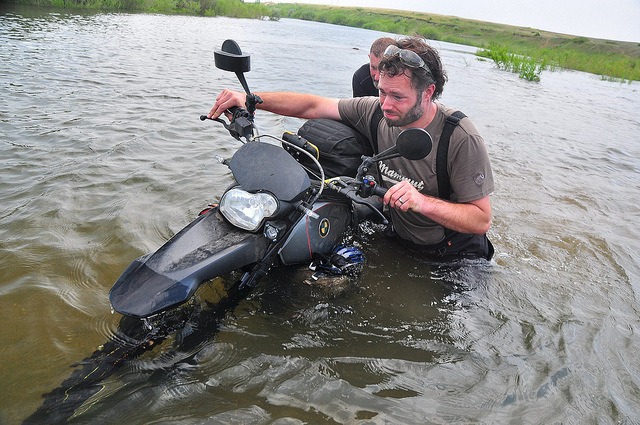 In 2012 he did just that, riding with Walter in Mongolia and Far Eastern Russia for five weeks. Walter’s pics and report start here. Bas is currently rebuilding Walter’s tired old Xch around an Xco donor bike. Bas’ g-friend Linda was also on that Russian ride with her Xco and when she turned up at the shop I took a close look at her set up. All the Xs in the shop seem to be running lowered footrest plates, (left), either DIY jobbies or made by Erik. Seems to improve comfort despite the greater chance of rut bashing. I may look into a set myself, as it’s easy to do. 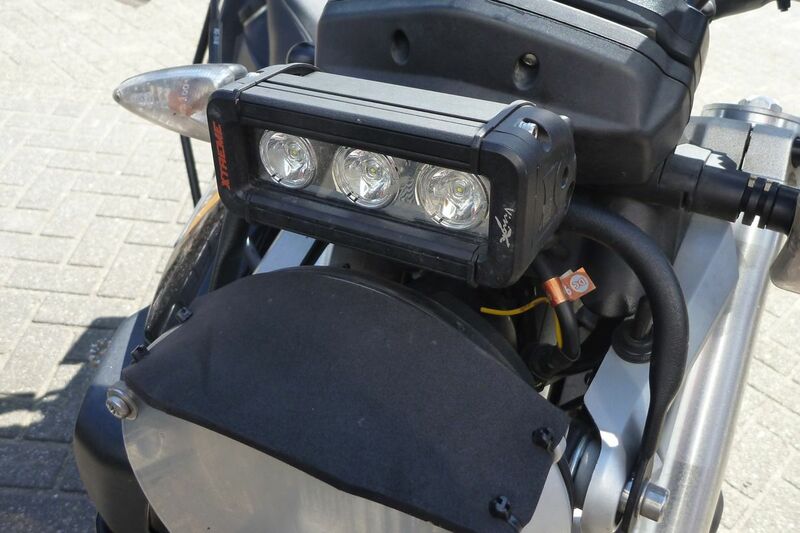 Both their bikes were also running a 5-inch VisionX Xtreme 3 x 5w LED light bar as sold by Adv Spec. Narrow beam is the one to go for according to Bas; it still puts out plenty of light to the sides and is what I feel my bike needs. I haven’t been so inspired to refit the Rigid SR-M light from my GS-R, bright though it was. 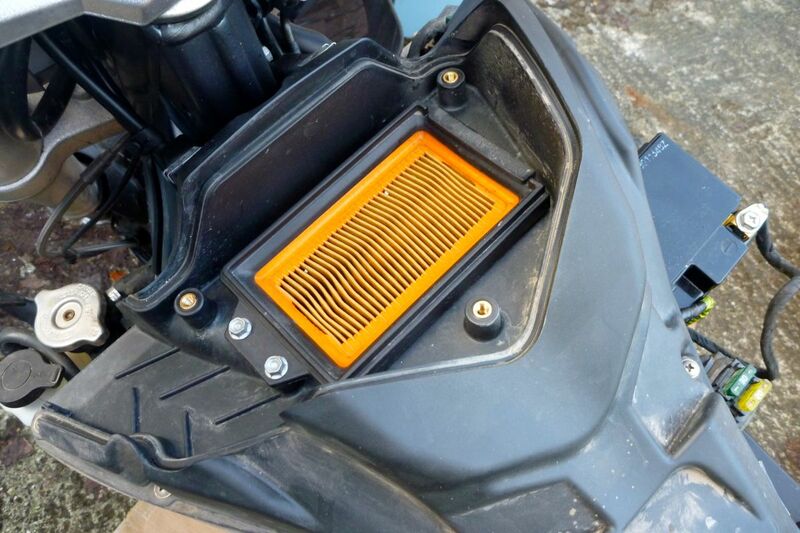 One thing Erik mentioned the day earlier was that the flat upper face of the OE paper air filter tends to shake and sieve desert dust in desert areas. So even though paper works well, oiled foam cleaned regularly is a better way to go on this bike. 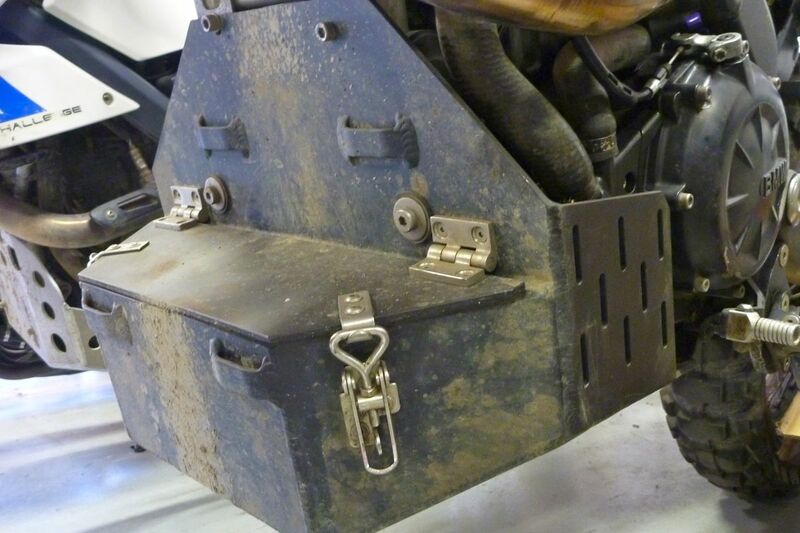 Though my screw on side stand foot plate was just a temporary measure added to a Wunderlich order, Bas was not such a fan of these as they come loose and fall off. I noticed one of the bikes had done a clever DIY job (right) giving the stand extra height to cope with the taller suspension, but it seems welding, just like I did in the old days, is the best way to do it. 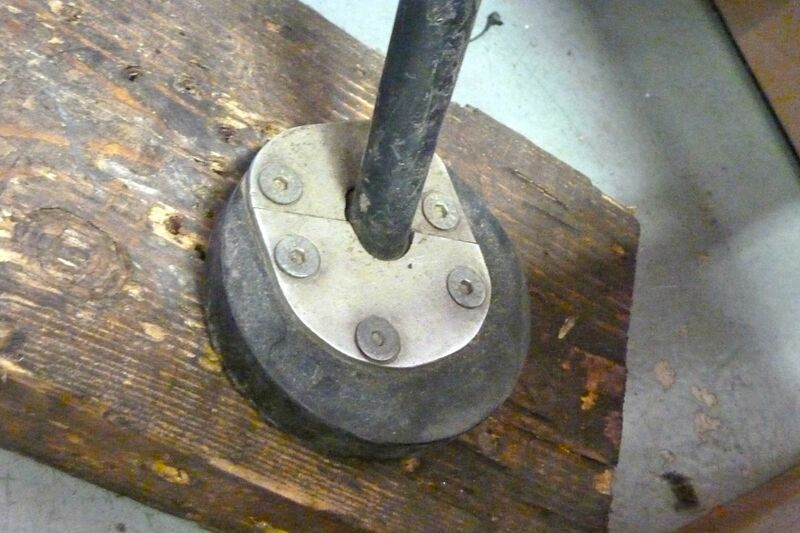 I now need to position a new plate carefully so as not to foul the shock’s reservoir. All the chain bikes in the shop were running chain oil drippers and I finally concede this is a way to go and plan to fit one in the near future. For a job that needs doing daily on the road, a can of Wurth Dry lube is just too bulky to carry around and anyway, without a centre stand, hand oiling is a pain. 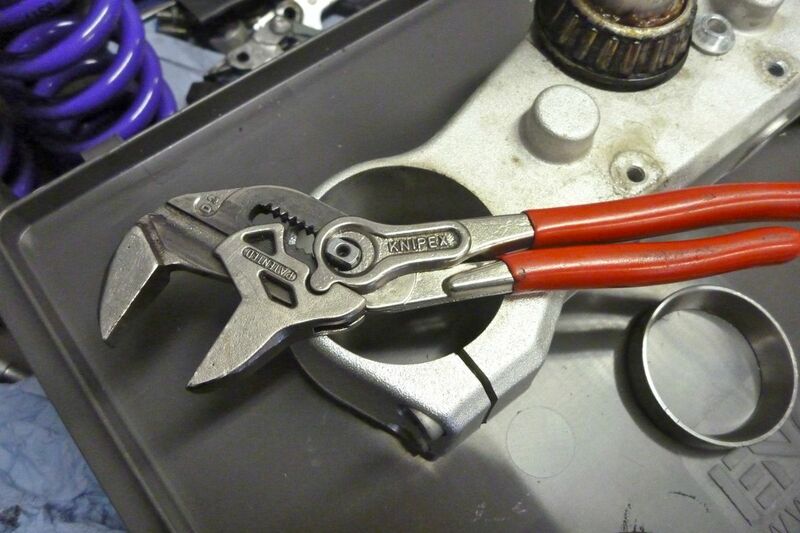 Among the array of fine tools in the Hyperpro shop was this Knipex adjustable spanner that uses grooves and a push button location to eliminate play, unlike those old knurled screw types. It looks like a very nifty general purpose too; I just ordered me the 86 05 180mm model off amazon for £34. Talking tools, nice case on this XCh’s bash plate (right), though now I’m not putting a tank there my tool pouches are as good I’ve decided. 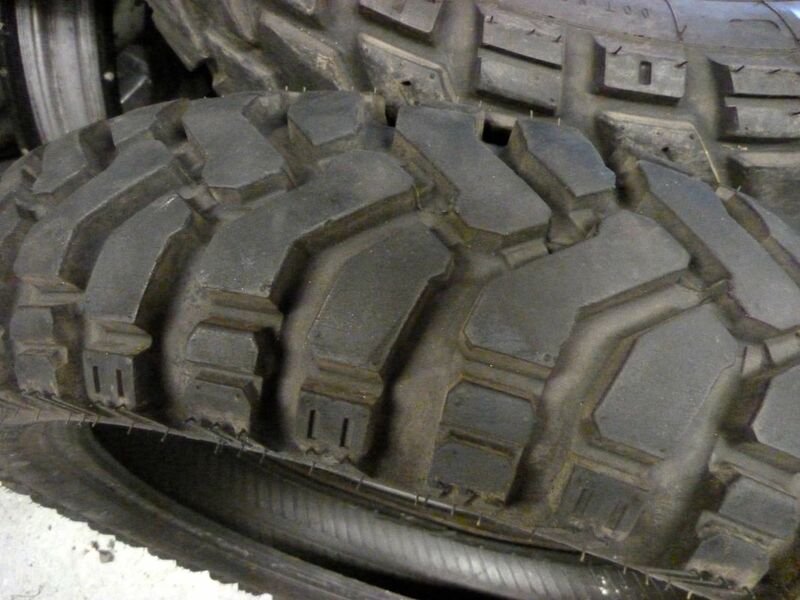 And I had a closer look at a Mitas E07 tyre which is what I’ll try for the next trip, at least for the back. Same properties as the Heidi K60, but possibly better. 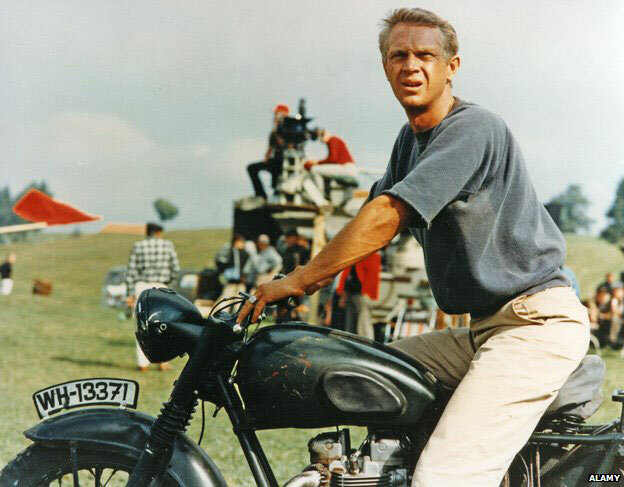 Finally, talking of Steve McQueen, a customer turned up on a Triumph Scrambler 900 similar to the McQueen Special produced last year to commemorate the film’s half-centenary. Great looking machine, like most Triumph twins, but heavy and when I briefly sat on it it didn’t feel right; seat way too wide. Couldn’t see me sliding confidentially around alpine meadows on that one. I’ll take a regular Bonneville or Bas’ elongated G/S. 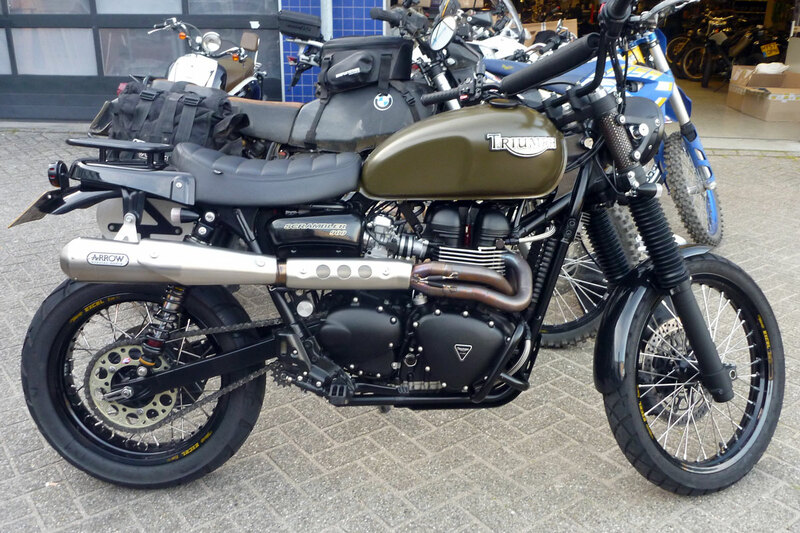 This entry was posted in Adventure Motorcycling Gear Reviews, AMH News, Project Bikes and tagged BMW 650X Country suspension, hyperpro hydraulic preload adjuster, Hyperpro suspension, Knipex adjustable spanner, progressive suspension, Steve McQueen TR6, the great escape, Walter Colebatch. Bookmark the permalink.